In a recent #UFchat on Twitter, pet peeves of the Urban Fantasy genre were discussed. One that came up was the lack of "new" monsters in the genre. Just how many vampires, werewolves, and demons can you handle? So here are some suggestions for lesser known monsters that would love to be in the spot light. I am giving away my upbringing here. What the heck is a hodag? The hodag is an American Folklore creature that made its appearance and home around Rhinelander, WI. In 1893 newspapers reported the discovery of a Hodag in Rhinelander, Wisconsin. It had "the head of a frog, the grinning face of a giant elephant, thick short legs set off by huge claws, the back of a dinosaur, and a long tail with spears at the end". The reports were instigated by well-known Wisconsin timber cruiser and prankster Eugene Shepard, who rounded up a group of local people to capture the animal. The group reported that they needed to use dynamite to kill the beast. A photograph of the remains of the charred beast was released to the media. It was "the fiercest, strangest, most frightening monster ever to set razor sharp claws on the earth. It became extinct after its main food source, all white bulldogs became scarce in the area." Could you not see a herd of these things menacing a tourist town in Northern Wisconsin. I know in Rhinelander they help bring in the tourists, but what if they got mad? 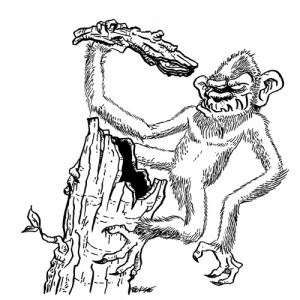 This one is nasty: It is a primate that lives in the tops of hollow trees and throws dead branches down on the lumberjacks. The Agropelter is a relatively small HAIRY-HOMINID which — much like its more famous cousin BIGFOOT — is said to reside in the lush arboreal forests of the Pacific Northwest and Canada, although there have been reports hailing from other states such as Minnesota. Eyewitnesses claim that the Agropelter is approximately 3-feet in height with a slender simian body and long spindly limbs. Often seen in trees, these creatures are said to be omnivorous and ostensibly nocturnal, with a bizarre penchant for tormenting humans, particularly lumberjacks — who, of course, are more prone to spend their time in deeply forested regions — by throwing dead tree limbs at their heads. I can already see a environmental story forming with this one. A forest gets cut down for the new shopping center and the Agropelter attacks! Last one for this post, is the most famous of the three. The creature has already been in TV shows and Bruce Springsteen wrote a song about it. So it is already familiar to many people. In some of the sightings it appears more human like. 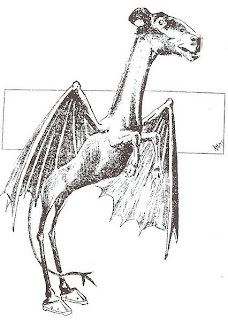 If you want to have demons menacing in your UF story, why not the Jersey Devil?